I was a paying customer of MyBlogLog - in fact, I liked the analytics better than the widget. When Eric Marcoullier and Todd Sampson set up OneTrueFan I very quickly added the widget to one of the blogs I run; my favourite place to share geeky discoveries. 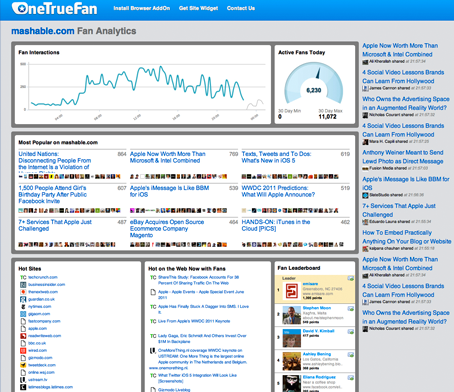 Today OneTrueFan have launched (in beta) their own analytics function. It's called Fan Analytics. Here's Mashable.com's profile. This is fantastic information for a site owner to have. It's also really useful information for any digital marketer to have. For example, I can see myself in Mashable's top 20 fans -- I don't share very much, I'm on the chart because I visit often (generally to clip content to Evernote). This set of analytics information is in real time. It means you'll be able to monitor a site to see how a story breaks from it, how certain subjects are being shared and who is doing it. I don't know whether Fan Analytics will continue to be open for everyone to monitor, whether it becomes paying customer only or used as a teaser and then recanted. What I do know is that data is hugely interesting. I can see, for example, that Mashable.com fans are also prone to reading the Guardian.co.uk, Reuters and even Search Engine Land. Just fantastically insightful.